Are you preparing Christmas gifts and dinner as well? I guess everyone is super busy now. Anyway, if you want to cook something else apart from the traditional Christmas dinner, here is a super presentable Chinese dish. Well, actually, I don’t know anywhere else you could get this dish in China apart from my dad’s kitchen. It is not one of his inventions, but I have never been able to find it outside home. I guess that one of the reasons is that it is a kind of time-consuming dish, many people could not be bothered. Oil, cooking wine, light soy sauce, five / thirteen spices powder, sesame oil, salt, ginger, spring onion. 1) Chop a small size of ginger, 1/3 of spring onion into small pieces. 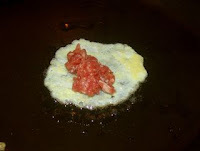 2) Mix the beef mince with 1 full tablespoon of cooking wine, 1 tablespoon of light soy sauce, 2/3 teaspoon of five/ thirteen spice powder, around 1 tablespoon of sesame oil or more, just less than 1 teaspoon of salt, and ‘minced’ ginger and spring onion. 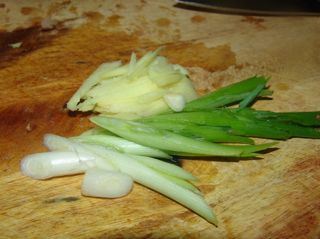 3) Also chop a small size of ginger and the rest of the spring onion into strips. 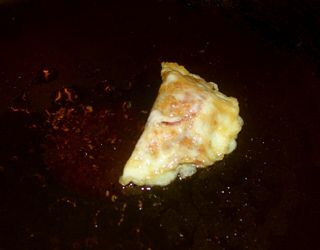 4) Beat around 3 eggs with a little pinch of salt. 1) Put a flat sauce pan on very low fire, and evenly apply a very thin layer of oil on the surface of the saucepan. 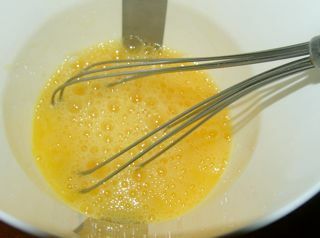 2) Pour in a tablespoon of whisked egg, make it into a generally round pastry. 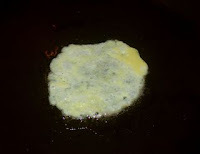 3) When the whisked egg is no longer in ‘liquid’ form, (if leaving the upper surface is a little bit ‘undone’ is better for folding up later — personal experience), put a small teaspoon of prepared mince onto the pastry, then fold up. 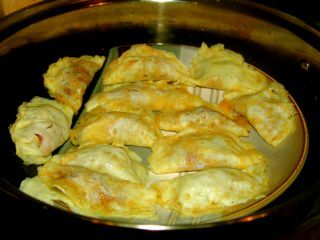 4) Place folded dumplings onto a plate. And finish the rest of eggs and beef mince, place them neatly on the plate. 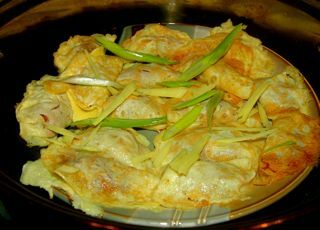 5) Place the plate of prepared egg dumplings into the steamer, and put chopped ginger and spring onion strips on top of the dumplings. It does not sound very difficult at all, no? The only part that needs more attention is the egg pastry, unfortunately there is no other way apart from patiently doing one by one, and they cannot be overdone, otherwise it will be difficult to adjust the pastry together, and obviously it has to be done enough to hold the filling. Because of the different pastry sheet, this steamed egg pastry dumpling tastes very different to normally flour pastry dumplings, and it can only be served as a ‘dish’, unlike the normal dumplings, which can be served as ‘stable’ food on the table. I think it is good to go with boiled rice, beer or wine.